VIGO Icicles Glass Vessel Bathroom Sink and Linus Vessel Faucet with Pop Up, Chrome by Vigo at The Synthesizer. MPN: VGT132. Hurry! Limited time offer. Offer valid only while supplies last. The VIGO Icicles Glass Vessel Sink and Vessel Faucet Set will bring some clarity to your home with an icicle-like pattern engraved into clear glass. 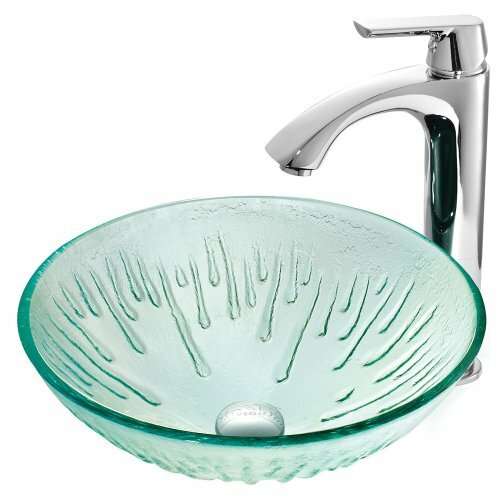 The VIGO Icicles Glass Vessel Sink and Vessel Faucet Set will bring some clarity to your home with an icicle-like pattern engraved into clear glass. Handcrafted with possible unique and slight color variations so no two sinks are identical. Each sink is a dynamic work of art that complements any style bathroom. With its scratch resistant glass and non-porous surface fading and discoloration is a thing of the past. The VIGO faucet features a modern single lever for temperature control. This faucet is created using top quality components, including a high quality ceramic disc cartridge means a drip-free, long lasting faucet. All VIGO finishes resist corrosion and tarnishing, exceeding industry durability standards. Includes solid brass pop up drain and mounting ring in matching finish. Faucet Overall Height: 12.375-in., Spout Height: 8.375-in., Spout Reach: 5.125-in.